Webster Vienna held two panels on the International Day for the Elimination of Violence against Women, focusing on the theme of victimization of women by extremist groups at a symposium in cooperation with the Academic Council of the United Nations (ACUNS). During two panels which dealt on one side with the "situation from various countries and regions" and on the other side with "practical measures which can be taken in order to tackle this problem," the guests of the symposium became aware of a highly sensitive topic. "Violence against women is the most atrocious thing, because when they die, they die as victims," said Michael Platzer, ACUNS Vienna Liaison representative. According to the ambassador of Norway to the International Organizations, Bente Angeli-Hansen, in many parts of the world the situation has deteriorated in the last five years. "The tactic of terror in the Middle East and in Africa destroys entire families and faciliates young fighters to join the terrorist groups," Angeli-Hansen said. She talked about "the birth of a new generation of warriors" that disrespects women by enslaving, opressing and brutalizing them. To combat it, she said, "We need a stronger commitment by governments." The panelists discussed various ways the international community must combat the problem. Activist and lecturer Amal Naggamy, from the Ben-Gurion University of the Negev, pointed out that "Europe should understand, that Islam is not what Daesh is talking about. Daesh controls people, which is more a form of Political Islam." Nasir Khan from the Vienna University explained that it is urgent to introduce "social reforms and religious awareness programs in the countrys with extremism." 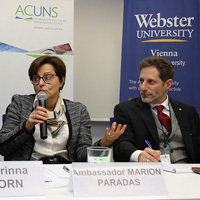 For Marion Paradas, French ambassador to International Organizations in Vienna, the "victimization of the most vulnerable people of the society which are women and children should be banned," and the knowledge of the younger generation about these violent and criminal acts should be higher. For Samuel Schubert, professor at Webster University, by "destroying the terrorist groups, the ability of controlling territorys could be destroyed immediately." The Ambassador of the United States to the International Organizations, Henry Ensher, said, "Education and health are the two areas for women who are not in the center of power; that is why the extremist groups put women in their place." See more images from the event in this Flickr album or on Facebook.